01.25.2004 - No, bat trapping does not work. At least, it's not a good way to handle a bat problem. Trapping bats is like, I don't know, using a lighter to cook dinner. It's just a dumb way to do it. No wait, trapping bats is like using a Cuban Cigar to cook dinner - dumb and probably illegal. It's true that many, if not most, nuisance wildlife species are controlled via trapping. If you've got a raccoon in your attic, you've likely got to set traps to catch it and remove it from the property. However, bats shouldn't be trapped. Some uninformed companies practice bat trapping, and bat traps are in fact sold, but they're stupid (both the traps and the companies). Here's how it works if you have bats in your building. First of all, you've got to find out how they're getting in. It could be one tiny hole, it could be 2000 linear feet of open fascia board, it could be rotting wood, open vents, etc. Whatever the entry, it's got to be found, all of the spots must be found, and sealed. However, the main spots that the bats use to enter and exit must be left open, and the bats allowed to exit these areas through one-way exclusion doors/nets/tunnels, etc. Most bat traps follow the same principle: a one-way tunnel, but instead of allowing the bats to fly free, the trap holds them, like in a box. 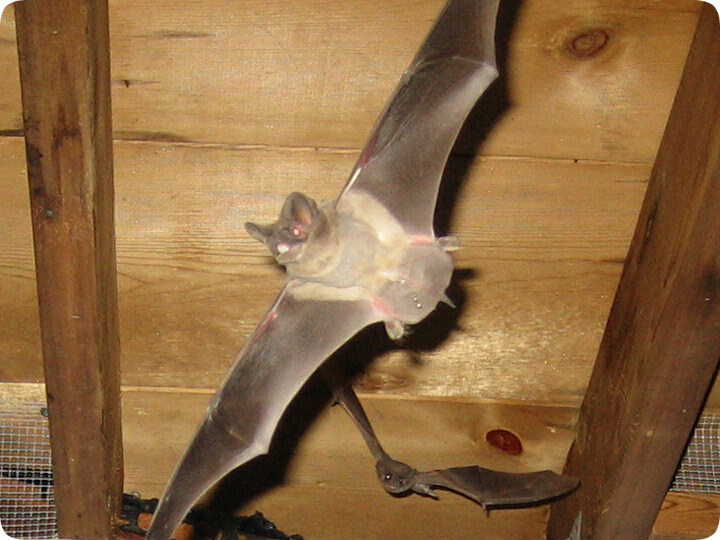 The trap usually inhibits full exit of all the bats, and then once inside, they are at risk - often they are exposed to heat or the cramped conditions kill these fragile animals. It is illegal to kill a colony of bats, and BCI (Bat Conservation International) condemns the use of bat traps. I mean, once the bats are trapped, then what? You can't kill them, so you must let them go. You'd have to relocate them thousands of miles to ensure that they wouldn't just migrate right back to their original territory in a matter of days. So why bother to expose the bats to health risks, expose yourself to lawbreaking, and make the job potentially less effective, when you can do it right, the BCI recommended way, the reasonable professional way, of just excluding them? The home must be sealed 100%, or new bats will get back in, so it's essential that the bat removal specialist seal up the building properly. Please, do not resort to bat trapping, or hire anyone who engages in it. Find a wildlife trapper who will, when it comes to bats, be a wildlife excluder. It's the right way to handle the job, the legal way, and the best for these marvelous creatures. Do it yourself: Visit my How To Get Rid of Bats page for tips and advice.